Mexico is an upper-middle-income country whose economy has grown steadily but more slowly than that of other emerging-market countries. Mexico was hard hit by the global economic crisis but has recovered since that time and has generally experienced slow but steady growth, with its GDP growing by 2.5% in 2015. The government enacted a series of economic reforms known as the “Pacto por México” beginning in 2012. Many of the benefits from Mexico’s economic growth have been unequally distributed as Mexico ranks in the top quarter of countries for unequal distribution of income. Poverty rates have stagnated in recent years with nearly half of the population living below the national poverty line, despite increases in per capita income. Over 60% of Mexico’s poor people reside in rural areas, and most are dependent upon subsistence agriculture. By international standards, agricultural productivity in Mexico is low. Agricultural growth has largely been concentrated in the commercial farming sector, and the rural poor have generally not experienced improvements in agricultural productivity. Following legislation adopted in 1992, the fundamental transformation of Mexico’s land regime, which allowed privatization and market transfers of ejidal land rights, is now largely completed. Follow-through is needed to: provide support to ejidal communities to protect lands they do not wish to see “parcelized” and to protect common resources; ensure an up-to-date and reliable land certification and registration process; increase support for women’s land rights; increase access to credit; and improve the functioning of land markets. Mexican cities are characterized by low population density and, as a result, urban sprawl is high. Urban sprawl negatively affects inner-city transportation and limits job possibilities for the urban poor, who may not be able to afford the high cost of transportation from peri-urban areas. Mexico must boost institutional capacity and strengthen collaboration for urban land use planning and development across all levels of government. Mexico’s development is constrained by numerous environmental challenges, many pertaining to water and forest resources. In the past 60 years, population growth has caused a fourfold reduction in the amount of available water per capita, putting Mexico under severe water stress. The northern Mexican states are intensely water-stressed, and there is increasing contamination of both surface and underground water. Mexico must improve its water management systems to avoid limiting its potential for further growth. Perhaps due to its high vulnerability to climate change, Mexico is an international leader in forest management and efforts to reduce and adapt to climate change. Although the rate of deforestation in Mexico has declined, it is still contributing to soil erosion and desertification. The effectiveness of Mexico’s forest management and climate change programs can be improved. Mexico is one of the leading mineral producers in the world. The government has adopted a package of energy reforms in an effort to reduce declining production of hydrocarbons while also moving to greater reliance on green energy. Effective implementation of the energy reforms is an ongoing challenge for Mexico especially in light of the need to ensure that meaningful social and environmental impact assessments and consultations with affected communities take place in a way that does not cause undue delay to needed energy projects. Most women in Mexico have not been direct beneficiaries of the land reforms initiated in 1992 and, despite statutory protections, traditional customs and practices (usos y costumbres) continue to restrict women’s land rights. Donors could work with the Government of Mexico to develop strategies for improving the recognition and protection of the land tenure rights of rural Mexican women. This could include a practical solution that “corrects” the existing land documentation by adding women’s names to land titles. Additionally, donors could implement programs focused on empowering indigenous women to exercise their statutory land rights, as well as work with customary institutions to encourage them to include women in comunidad and ejido decision-making processes. Land registry offices in Mexico are located primarily in state capitals. Thus, many transactions are never recorded in the registry so that information in the registry becomes increasingly out of date and unreliable. Donors could support pilot projects that essentially take registration services to the people, possibly through mobile units, temporary offices or by making services more available through the internet (although the latter option will require improving internet access in rural areas). Individual farmers may in some cases have lands that are too small to farm productively, and fragmentation of ejidal land has, by some reports, become problematic. Accurate data on the extent of fragmentation and its effects is not currently available. Donors could work with the Government of Mexico to study trends in land fragmentation, and its potential impact on land use and land conversion, as well as its governance, economic, financial and environmental effects. Donors could further partner with the Government of Mexico to explore ways to support owners of small-scale farms in developing competitive economies of scale through community associations, alliances, and partnerships. Despite the creation of the Ministry of Agrarian, Territorial and Urban Development (SEDATU) in 2013, there is poor coordination among the many federal, state and municipal agencies that divide responsibility for urban transport, land use and environmental protection, disaster risk management, and housing. Low capacity and insufficient resources restrict urban and land use planning functions at the state and municipal levels. Thus, most cities lack a coherent vision and long-term plan. Donors could support efforts to coordinate institutional activities and build capacity to produce a more efficient and effective system of urban and land use planning, including one that can better respond to natural disasters. One of the most severe water problems in Mexico is the increasing contamination of surface and ground water. Over 70% of all lakes and rivers are polluted to some extent. Water quality is harmed by agricultural runoff, lack of municipal sewage facilities and disposal of much of the industrial wastewater without adequate treatment. Donors could work with the Mexican government to develop and implement a practical cross-sector strategy to reduce water pollution and clean up polluted waterways. The availability of water has decreased alarmingly in the last 50 years, caused in large part by climate change and an inefficient use of water resources in urban areas and in agriculture. Donors could support efforts to develop an integrated water management system under the National Water Plan 2014-2018 that could include some or all of the following: (a) improving the efficiency of urban services; (b) developing and implementing an effective water financing system that incentivizes optimal use of water resources; (c) strengthening the enforcement of water rights; and (d) improving the efficiency of water usage in the agriculture sector. Mexico is a global leader in forest management and has experimented with REDD+ and other programs that provide payment for environmental services. The deforestation rate has declined but is not yet zero. Moreover, despite receiving a significant amount of Mexico’s forest investments, reforestation efforts have achieved modest results. Donors could continue to support the implementation of REDD+ in Mexico. They could also support programs, such as long-term systematic monitoring of forest conditions, to increase the land areas subject to reforestation and improve the quality of the new forests. The mining industry in Mexico has been plagued with conflict and alleged human rights abuses. Donors could work with the government to implement legal and other safeguards for mine workers, and to ensure that workers have fair and equitable access to the justice system in the event of grievance. Mexico is an upper middle-income country characterized by dramatic regional and urban-rural differences in income and quality of life. Measured against international poverty rates, 3% of the population lives in extreme poverty (less than $1.90/day). Mexico continues to be plagued by violence arising from turf battles between drug cartels in northern Mexico. Although the numbers are declining somewhat, incidents associated with organized crime have killed at least 80,000 people since 2006 (World Bank 2017; Congressional Research Service 2015). Mexico implemented a large-scale land reform that began after the revolution in 1917 and ended in 1992. The reform distributed more than 100 million hectares from large farms to groups of households organized into ejidos (collective holdings). Indigenous groups also gained rights to their commonly held land during this period, which they organized into comunidades (forms of collective ownership). These ejidos and comunidades, however, lagged behind the development of privately held farms, and collective owners were more likely to be poor. In 1992, Mexico fundamentally changed its land regime and allowed privatization and market transfers of ejidal land rights. This reform is now largely completed, though it has been hindered by: a somewhat inaccessible land registration system; insufficient protection of women’s land rights; and lack of credit or marketing mechanisms. A large part of Mexico’s rural population faces significant challenges in overcoming poverty and entering a future of broad-based, sustainable development in the countryside. The rural sector is characterized by poverty for most residents. Rural living standards are much lower than those in urban areas. Although the percentage of the rural population that is undernourished is declining it is still significantly higher than in the urban population. Rural areas are home to 61% of Mexico’s extreme poor. A majority of farmers are subsistence-oriented small farmers. In the latter half of the twentieth century, Mexico experienced a fundamental shift from a rural to an urban society. This dramatic urbanization strained the ability of the Government of Mexico (GOM) to build urban infrastructure, including housing. The lack of affordable, well-constructed housing has meant that rural-urban migrants cluster along the periphery of urban centers. This has led to the proliferation of informal settlements. Women in Mexico were largely excluded from land redistribution programs and most ejidal land is held by men. Most women are not voting members (ejidatarios) of ejidos and do not hold use rights. The 1992 reforms have in some cases further eroded women’s rights in ejidos, as only ejidatarios were allowed to vote on new regularization and tenure regimes, and only ejidatarios’ land rights were strengthened through these processes. Mexico faces several environmental challenges, mainly pertaining to water and forest resources. The northern Mexican states are intensely water-stressed, meaning that they face limited water availability, aquifer over-pumping, pollution, and extreme events such as drought and water conflicts. One of the most severe water problems in Mexico is the increasing contamination of both surface and underground water. Thirty-four percent of Mexico’s land area is forested, and the average annual deforestation rate is 0.24%. Deforestation contributes to soil erosion and desertification. Between 2010 and 2015, Mexico lost approximately 458,000 hectares of forests. Forest degradation and deforestation continue, primarily due to the conversion of forests to agricultural and pasture land. The Government of Mexico, with donor support, has undertaken significant measures to improve natural-resource management, including incorporating the Reduction of Emission from Deforestation and Forest Degradation (REDD) Program into existing forest management systems. Although Mexico is one of the leading mineral producers in Latin America, the mining industry is a source of conflict and alleged human-rights abuses. Many mining jobs are short-term and low-wage. In several instances, mine workers and security forces have violently clashed over unionization and salary, resulting in injuries and fatalities. Mexico has a total land area of 1.9 million square kilometers and a 2015 population of 127 million people. Twenty-one percent of the population is rural, while the remaining 79% live in rapidly developing urban areas. In 2015, Mexico’s GDP grew to $1.14 trillion, 3.6% of which was agricultural, 33% industrial, and 64% related to services. According to international poverty standards, 11% of the population lives below the poverty line and 3% lives in extreme poverty. Based on Mexico’s national poverty line, however, roughly half (53%) of all Mexicans are poor. By the same standard, poverty is most intense in rural areas, with 62% of the rural population being impoverished, as compared to 42% of the urban population. Approximately 13% of the population is engaged in agriculture (World Bank 2017; Reuters 2015). Development patterns in Mexico differ between the northern and southern parts of the country. For example, northern Mexico is largely urban and industrialized, and only about 10% of inhabitants live in extreme poverty. In contrast, southern Mexico has a less developed economy, primarily based on subsistence agriculture. About 25% of the population of Mexico resides in six southern states–Guerrero, Oaxaca, Chiapas, Michoacán, Veracruz, and Puebla–but those states are home to 37% of the nation’s poor and 57% of its extreme poor. Among those who speak indigenous languages, 38% live in extreme poverty (Aguilera 2015; Hernandez 2015). About 80% of Mexicans live in urban areas. Urbanization in Mexico has been fueled by rural-urban migration and population growth. Migrants leave rural areas that lack job opportunities, such as the southern states and the densely populated central plateau, for urban centers and the US-Mexico border. Rapid urbanization is particularly evident in Mexico City – the country’s largest city – where 21 million people live in its metropolitan area. Just under 29% of the population of Mexico City is considered poor or moderately poor. The urban area has expanded to overtake steep hillsides and dry lakebeds, on which informal settlements have developed (World Bank 2017; CIA 2017; Connolly 2003; USDOS 2010). Urban land scarcity is not an acute problem in Mexico’s cities, except in those located in the mountains or in marshy areas. Empty lots represent approximately 20% of the residential land stock. However, a housing deficit and scarcity of affordable land affect population density patterns. About 31% of Mexican households are affected by the national housing deficit. Households that cannot afford legal or regularized housing cluster along the urban periphery (World Bank 2009b; OECD 2015a). Mexican cities are characterized by low population density and, therefore, urban sprawl is high. In the 7 years ending in 2013 more than 70% of new homes in urban areas were built on the periphery. Even within city centers, many households have single detached homes on relatively large lots. Urban sprawl negatively affects inner-city transportation and limits job possibilities for the urban poor, who may not be able to afford the high cost of transportation from peri-urban areas (OECD 2015a). Fifty-five percent of Mexico’s land area is agricultural land, and 5.4% of cropland is irrigated (World Bank 2017). By international standards, agricultural productivity in Mexico is low, especially among smallholder farmers who are estimated to be no more than 20% as productive as commercial farmers. Poverty in rural areas is correlated with low agricultural productivity. Agricultural growth has largely been concentrated in the commercial farming sector, and the rural poor have not benefited from economic growth. Commercial farmers and rural entrepreneurs represent a small minority and are mostly driven by the export market. Further, state investment has favored private lands over ejido and comunidad lands, and private lands have thus benefited more from irrigation and other infrastructure projects (FAO 2016; UNCTAD 2012). Mexico faces environmental challenges in almost every region. Thirty-four percent of Mexico’s land area is forested, and the average annual deforestation rate is 0.24%. Deforestation contributes to soil erosion and desertification. Along Mexico’s coastlines, inadequately regulated exploitation of petroleum deposits has damaged water and fisheries. In addition, urbanization has increased pollution, causing health problems and damaging ecosystems on the urban periphery. Thirteen percent of total land area is nationally protected (Conservation International n.d.; World Bank 2017). Mexico is one of the areas with the most frequent occurrence of hurricanes, floods and earthquakes. In fact, over the past 40 years the average annual occurrence of such disasters has quadrupled. The country has made some progress in responding to them in the form of public funding and innovative strategies for risk financing and insurance. But poor urban and land use planning, population growth and rapid expansion of Mexican cities leave the country increasingly vulnerable to natural disasters (World Bank 2013; OECD 2015a). Mexico underwent a profound agrarian reform beginning with the Mexican Revolution of 1910 and ending with neoliberal reforms in 1992, the effects of which are still being realized. A primary cause of the 1910 revolution was inequitable, feudal-like land distribution, in which landless Mayan laborers worked in indentured servitude for large-scale private farms. Between 1917 and 1992, the GOM distributed approximately 103 million hectares – 56% of the country’s arable land and 70% of all forestland – from large private farms to ejidos and comunidades, rural village collectives in which land was held communally. The government retained ownership of the redistributed land, allocating only usufruct rights, which were not alienable, to members of the newly formed ejidos and comunidades (Barnes, et al. 2015; de Ita 2006; Deininger and Bresciani 2009; Castellanos 2010). To obtain ejido or comunidad land, groups applied to the federal government. To become members, people had to establish residency within the ejido or comunidad. In most ejidos and comunidades, members received: (1) usufruct rights to a portion of land for their house; (2) usufruct rights to a portion of land to farm individually; and (3) rights to shared access to communally held property and land of the ejido or comunidad. In terms of individually farmed land, members (and their families) were allowed to farm individually up to 4 hectares of forestland and up to 8 hectares of brush land, and land was supposed to have been divided equally among members. All ejido members had voting rights through the ejido’s General Assembly, through which they also elected a leader called a comisariado. To retain their holdings, ejidatarios had to fulfill mandatory work requirements and had to maintain the land in agricultural production. Usufruct rights to ejidal land were considered a family’s patrimony and could be inherited. The GOM distributed social benefits through the ejido structure, tying aid to the requirements imposed on members (Castellanos 2010; Deininger and Bresciani 2009; Barnes, et al. 2015). Through a constitutional amendment in 1992, the GOM gave ejidos and comunidades the opportunity to privatize their land, creating the possibility for significant changes in land-rights distribution in (mostly) rural Mexico. The goals of the amendment were to increase the efficient functioning of factor markets (specifically land and credit markets), increase agricultural investment, facilitate urban expansion into areas controlled by ejidos and comunidades and reduce poverty in those areas. The overarching goal of improving efficiency in agricultural production was further driven by: (1) awareness that the rural population was aging; and (2) the need for increased international competitiveness due to the North American Free Trade Agreement (NAFTA). Rural Mexico’s response to these changes has been lukewarm. Initially, the reforms were greeted with widespread concern that changes in the land tenure structure would lead to land sales on a massive scale and the disappearance of the social sector. In fact, land rights in Mexico have not changed hands on a large scale following the constitutional and legal changes of 1992 (Deininger and Bresciani 2009; Barnes, et al. 2015). The World Resources Institute, through its LandMark project, estimates that 55.6% of Mexico’s land is held as indigenous and community land. While much of this land is rural, there is also some in urban areas (Barnes, et al. 2015; Deininger and Bresciani 2009; Landmark 2017). In addition to lands held by ejidos and indigenous comunidades, 73 million hectares of rural land in Mexico are owned by 1.6 million private landholders. To prevent the excessive concentration of land, the GOM sets a maximum legal limit on the number of hectares (100 irrigated hectares) that can be held privately and by commercial enterprises (PWC 2015; de Ita 2006; Constitution of Mexico, Article 27). Protected areas (such as national parks, and ecological reserves) constitute about 13% of total land area (World Bank 2017). Ethnicity in Mexico is broadly divided into mestizo and indigenous people, though these titles are used to designate cultural rather than racial groups. Indigenous people are the most marginalized segment of Mexican society with an extreme poverty rate four times greater than the general population. Indigenous communities have higher rates of illiteracy, lower rates of education and employment, and significantly higher rates of morbidity, mortality and nutritional deficiency. They also are more likely to lack access to improved water and sanitation sources. The majority of indigenous people live in urban areas. In addition, rural poverty is concentrated in areas with a higher density of indigenous people (Esquivel 2014; World Bank 2015; IFAD n.d.; CIA 2017). Mexico experienced rapid urbanization in the second half of the twentieth century and this has continued in the first part of the current century. Mexico City, Guadalajara and Monterrey are the largest cities in Mexico. While dramatic urbanization has strained the GOM’s ability to build urban infrastructure, in recent years the country has experienced a rapid expansion of its housing stock. Indeed, Mexico has one of the highest vacancy rates in the OECD. While the quantitative housing deficit has been largely addressed, the country has had less success in meeting the demand for permanent housing. As a result, a large share of new housing is self-built and without legal titles and about 25% of the urban population lives in informal settlements. The lack of adequate land available to low-income people together with substandard land-use planning and permitting practices have caused many people to settle on river banks, unstable hills and other risk-prone areas, with devastating social and economic costs in the event of natural disasters (CIA 2017; OECD 2015a). Slum settlements can be divided into five types. Colonias populares are unconsolidated informal settlements located in high-risk areas. Many residents of these settlements lack secure title to the land on which they live. Quality of life varies within and across colonias populares. Many are home to poor and middle-income families; many have infrastructure and services that have been provided through combined efforts of local government and the resident households; in some of these settlements, housing is of solid construction; and in many cases tenure has been regularized and titles issued. Regularization has not, however, provided permanent tenure security, as legalized properties can become illegal again through intestate inheritance, dilapidation and financial problems. Inner-city slums (vecindades) are comprised of small-scale (one- or two-bedroom units) older housing in inner-city neighborhoods that have deteriorated over time and now house the poor. Ciudades perdidas are small-scale shanty settlements located on vacant land or in undesirable urban locations. Cuartos de azotea are a form of makeshift accommodation located in servant quarters and on the roofs of apartments or public housing. Deteriorated public housing projects consist of subsidized units originally built by the GOM for the working class. These have largely fallen into disrepair and are now prone to overcrowding and other social problems. According to UN-Habitat, as of 2015, approximately 11.8 million people live in urban slums in Mexico which translates to 14.4% of the urban population. Mexico City has the largest percentage of urban slum dwellers in the country (22.8%), followed by Guadalajara (5.1%) and Monterrey (4.7%) (UrbanData 2015). The Constitution of Mexico (1917) establishes the basis for land relations. The key article regarding land tenure, Article 27, was amended in 1992 to reflect the country’s new tenure regime which allows the certification, transfer, and privatization of ejidal and comunidad land. The amended Article 27 is implemented by the 1992 Agrarian Law. The Constitution provided for a land redistribution scheme under which, until 1992, land could be taken from large landowners and distributed to landless laborers. The Constitution also provides that indigenous communities can reclaim their historic landholdings (Brown 2004; Barnes, et al. 2015). The 1992 Agrarian Law’s key tenets include: (1) ending land redistribution from private farms to ejidos; (2) privatizing the housing plots of ejidatarios; (3) allowing for leasing of ejidal land to parties both within and outside of the ejido; (4) allowing for sales of ejidal land within the ejido; and (5) allowing for the full privatization of ejidal land (disincorporation of the ejido) through a two-thirds vote of the General Assembly. The law also recognized the ejido as a legal person and, as such, able to enter into contracts and joint ventures. The law also established new rules on expropriation, including a requirement of mandatory compensation, and created a new system of agrarian justice independent of the executive branch (Deininger and Bresciani 2009; Castellanos 2010; Barnes, et al. 2015). Regulations issued pursuant to the 1992 Agrarian Law also contain important provisions regarding ejido relations and land tenure. These include: the Regulations of the Agrarian Law on Matters of the Certification of Ejido Rights and Title to Plots of Land; the Regulations of the Agrarian Law on the Code of Rural Lands; and the Regulations of the Agrarian Law for the Promotion of the Organization and Development of Peasant Women (González and Lopez- Gastélum n.d.). The General Law on Human Settlements (1976) and the Law of Environmental Equilibrium and Protection also govern some aspects of ejidal land rights and development. The first of these was adopted to address rapid development of the informal urban settlements, which often took place illegally on ejidal lands. The law required state-level governments to administer urban planning (González and Lopez-Gastélum n.d.; Castillo 2004). The Federal Civil Code and the states’ commercial laws govern all matters regarding ejidal land that are not specified in the laws mentioned above, as well as the sale, mortgage and registration of non-ejidal private land (Martindale-Hubbell 2008; González and Lopez-Gastélum n.d.). There are four broad categories of landholding: private; federal; ejidal/comunidad; and possessory rights held in colonias (informal settlements) (Brown 2004; Penner and Associates n.d.; Barnes, et al. 2015; Payan and Correa-Cabrera 2014; Lombard 2016). Private property. Property owned by a private individual or corporate body and can be freely bought, sold, leased, mortgaged and inherited. In Mexico, rights to private property are referred to as “domino pleno” (i.e. freehold). Although the 1992 Agrarian Law gave ejidos the right to fully privatize their land, some observers argue that the law does not actually allow for full privatization because it grants the ejidatario’s family members a right of first refusal for any ejidal land offered for sale and allows the government to set mandatory minimum prices for land sales. Federal property. This term applies to land owned by the national government and includes areas of public interest such as forests, and areas of public benefit, such as roads and airports. Ejidal and comunidad lands. Owned by the state, ejidos and comunidades are managed communally by their residents. Individual households often hold individual land plots. Many ejidos and comunidades contain a mix of some individually parceled land as well as some land that is held and used communally. Since 1992, ejidal land can be freely leased and sold to other ejido members. Further, these lands can now be privatized and sold to outsiders if the ejidal body decides to privatize. Comunidades cannot sell or lease land, but do have the option of converting into ejidos, which would give members the option to make this decision. Ejidal land cannot be subdivided for inheritance, and thus inter-generational transfers cannot be formalized. Colonias. These informal urban settlements have developed on formerly vacant land. Colonias residents often hold a right of possession, which is similar to private ownership, but subject to restrictions on transfer. Private land can be acquired by purchase or inheritance. Land in the ejidal sector can be acquired by inheritance or in some cases by lease or purchase (Penner and Associates n.d.; Castellanos 2010; Barnes, et al. 2015). Mexico has two systems for land-rights registration: the National Agrarian Registry (RAN), part of the Agrarian, Territorial and Urban Development Secretariat (SEDATU), for all rights pertaining to ejidos, comunidades and colonias; and the Public Registry of Property for all rights pertaining to private property (Penner and Associates n.d.; Barnes, et al. 2015). As a part of the 1992 reforms, the GOM instituted a massive land-rights regularization program known as PROCEDE (Program for the Certification of Ejido Land Rights and the Titling of Urban House Plots, or Programa Nacional de Certificación de Derechos Ejidales y Titulación de Solares Urbanos). The goals of this program were to register and title land rights in ejidos and comunidades to strengthen land-tenure security, improve the efficiency of rural land markets (and credit markets), and pave the way for privatization. PROCEDE began with a large-scale information campaign, in which PROCEDE officials met with ejido General Assemblies. PROCEDE then guided the ejidos through a series of options and votes regarding the regularization and possible privatization processes. The ejido first voted to determine whether it wanted to join PROCEDE. The primary benefit to joining PROCEDE was that members would receive up to three land titles (one for their house plot, one for their farm plot and one representing a percentage of the value of the common goods, including common lands). Another important benefit of joining PROCEDE was individual plot delineation. If ejidos voted to join PROCEDE, as most did, the second vote determined whether members should receive any or all of the three titles listed above, and how much land to assign to each category. The third vote was whether to disincorporate the ejido through full privatization (Barnes, et al. 2015; Deininger and Bresciani 2009; Castellanos 2010). PROCEDE worked to resolve boundary conflicts between neighboring ejidos and comunidades and to recognize the property rights of individual members within each ejido and comunidad. Under PROCEDE, RAN issued land certificates to document individual parcels and each household’s proportional share of common lands. RAN also issued titles for lands that were privatized; these rights were then also documented in the local public registry of property. If an ejido voted to disincorporate, PROCEDE notified RAN, which closed the registry for this land. PROCEDE then assisted the ejido in registering the land with the local Public Registry of Property (Barnes, et al. 2015; Deininger and Bresciani 2009; Haenn 2004). Although PROCEDE ended in 2006, its activities were taken on by RAN and the Comision para la Regularizacion de la Tenancia de la Tierra (CORETT), which was charged with addressing tenure issues in informal settlements within ejidos and comunidades. Overall, the program was highly successful in regularizing land rights across rural Mexico. By 2012, the land of 94% of rural ejidos had been certified (Barnes, et al. 2015; Deininger and Bresciani 2009). One important aspect of PROCEDE was that ejidos were allowed to recognize new members based on actual occupation. By 2000, PROCEDE had recognized and given title to over one million land plots in urban and rural areas that were previously held by unofficial ejido members or land possessors whose rights were insecure (Deininger and Bresciani 2009; Castellanos 2010; Barnes, et al. 2015). Problems related to the certification process in Mexico include concerns that although initial coverage of the certification program has been widespread, maintenance and updating of the registry may be a problem. Ejidal land cannot be subdivided for inheritance and, thus, inter-generational transfers cannot be formalized. Further, the certification process generally only certifies land in the name of the male head of household rather than jointly to husband and wife. Concerns over the security of wives’ land rights remain (Brown 2004; Barnes, et al. 2015). PROCEDE has not led to mass privatization and selling of ejidal lands, despite the hopes of some and the fears of many. As of 2007, more than 80% of ejidos participating in PROCEDE had chosen not privatize any of their land and less than 5% of all such land had been privatized. More recent estimates suggest that only 6-9% of all ejidos (including those not participating in PROCEDE) have privatized some or all of their land, representing 2.5% of all ejidal land. Increasing land values, urbanization and infrastructure development appear to be the most important drivers of privatization. Observers note several reasons ejidos have not chosen to privatize: (1) private property is subject to taxes; (2) ejidatarios did not perceive a strong financial impetus to undergo privatization because they did not think they could succeed as independent small farmers; and (3) land is more than a commodity to most ejido members, representing a life-long struggle for liberty and the pivotal asset saving peasant farmers from becoming day laborers. In addition, most ejidos had been farmed on a subsistence level – only 15% were considered commercially viable – and the government did not provide sufficient institutional support for small farmers. Small farmers lacked access to modern technology, and competition in agricultural production increased significantly following NAFTA (Barnes 2009; Deininger and Bresciani 2009; Castellanos 2010; Barnes 2014; Sinkler 2014; Barnes, et al. 2015; OECD 2015a). It is difficult to measure whether or not PROCEDE resulted in increased agricultural investment due to perceptions of improved tenure security or improved access to credit. Although controlling for external factors is difficult, there is strong evidence that PROCEDE did not result in a net increase in ejidatarios’ access to credit and thus had only a limited impact on investment (Bresciani 2004; de Ita 2006; Deininger and Bresciani 2009). In 1993, the GOM established CORETT, which was charged with a role similar to that of PROCEDE, but with the purpose of regularizing ejido and other land within or adjacent to urban centers. CORETT verifies the eligibility of the land on which informal settlements are located for regularization and then works with government authorities to create an urban plan for the area. According to USAID/Mexico in 2011, informal housing areas must first obtain access to electricity from the Federal Electricity Commission (Comisión Federal de Electricidad), the country’s sole, government-owned power utility, and then other government entities work to provide additional services, including provision of individual titles. CORETT then sells the land to the current residents for a social price that is based on their socioeconomic status within the community, the size of their plot, and the existing or intended use of their plot. The CORETT program is still in place, with a current focus of helping low-income people in informal settlements to register and title their land. It has issued titles to 2.5 million households since its formation. But, according to one estimate, this leaves over 7 million informal plots in Mexican cities (GOM 2010; Barraza and Associates 2009; Castillo 2004; Brown et al. 2006; Salazar 2015; GOM 2017). Transactions for all private lands must be recorded in the Public Registry of Property. Land registry offices in Mexico are located primarily in state capitals. Thus, many transactions are never recorded in the registry so that information in the registry becomes increasingly out of date and unreliable. Registration of private land is widespread. Registration of a property transaction requires eight procedures, takes 472 days, and costs approximately 5% of the property’s value. The procedure requires that the notary public: (1) obtain a zoning certificate from the corresponding Federal District Department; (2) obtain a non-encumbrance certificate from the Federal District Department; (3) request a commercial valuation of the property; (4) obtain a certificate of good standing of water service; (5) obtain a certificate of good standing of the seller regarding payment of property taxes; (6) formalize the purchase and sale agreement; and (7) register the transfer of title at the Public Registry of Property of the Federal District (Barnes, et al. 2015; World Bank 2016; World Bank 2017a). Foreigners cannot purchase residential real estate in restricted zones. These areas include lands within 30 miles of the coast and 60 miles of the national borders. Such lands can, however, be acquired through a 50-year extendable trust mechanism known as a fideicomiso in which a Mexican financial institution acts as trustee. Foreigners can indirectly purchase land outside residential zones through a legal entity formed in Mexico (US State Dept. 2017; PWC 2015; Martinez and Enriquez 2016). Women enjoy largely equitable statutory land rights in Mexico. The Constitution establishes broad principles of gender equality. The Federal Civil Code (1928) governs most legal aspects of property distribution within marriage as well as succession and provides that spouses have equal authority to administer property (GOM Constitution 1917; OECD 2014). At the time of marriage, spouses must state whether they are marrying under the system of community property (shared property) or separate property (independent control of property). Persons who live together for two years or longer or who conceive a child and who could otherwise marry are considered bound by common-law marriage and have the rights and obligations of legally married spouses (Martindale-Hubbell 2008; Garcia and Noriega 2015). Under present law, an ejidatario can designate whomever he or she wishes to inherit the land. Ejidal land cannot be subdivided for the purposes of inheritance. Inheritance is the predominant way that ejidatarias acquire title to ejidal land. Without an explicit designation, the default order of succession is: spouse; companion; one child; one parent; and, finally, anyone who is economically dependent upon the deceased. However, land inheritance by sons is very common in rural areas, while daughters inherit only when they do not receive a dowry at marriage (Brown 2004; Semillas 2013; Barnes 2014; Barnes, et al. 2015; FAO 2017; OECD 2014). Despite equitable statutory rights, in practice women have unequal access to land rights. Traditional customs and practices (usos y costumbres) often discriminate against women. Under usos y costumbres, there is a strong male preference in the inheritance of land and generally only sons inherit. In addition, women have largely been excluded from land redistribution efforts. For the first 50 years following land reform, the exclusion was legal, but even as legal restrictions were lifted, cultural barriers remained. Initially, women were only eligible to become members of ejidos or comunidades if they were widows or single women supporting a family. Though this rule has since been revoked, most women do not hold use rights and are not voting members of ejidos or comunidades. Only about 16-20% of ejido members are women and, in 2007, only 2% chaired the ejido council. Some comunidades even bar women from their meetings (Brown 2004; Semillas 2013; Barnes, et al. 2015; FAO 2017). According to most observers, the 1992 reforms have further eroded women’s rights on ejidos and comunidades. Since most women were not official members of these groups, they were unable to vote on critical land-tenure issues under PROCEDE, and were also not recipients of strengthened land rights. In addition, ejidal plots that are privatized can now be sold by the head of household, rendering the land rights and access of women within the household less secure. While spouses have the first right of refusal, they very well may not have the financial resources to purchase the plot (Brown 2004; Haenn 2004; Barnes, et al. 2015; FAO 2017). In 2013, the government created the Ministry of Agrarian, Territorial and Urban Development (SEDATU) to oversee housing and urban policy. This was an effort to have a more coordinated response to Mexico’s urban challenges. SEDATU was established to bring together and harmonize the actions of several ministries and agencies involved in housing, transport and urban-related services at all levels of government. However, coordination among the several agencies at the federal, state and municipal levels with responsibility for urban transport, land use and environmental protection, disaster risk management, and housing is still inadequate. In addition, low capacity and insufficient resources restrict urban and land use planning functions at the state and municipal levels. Thus, most cities lack a coherent vision and plan for the future. (OECD 2015a; World Bank 2013). The Secretary of Agrarian Reform (Secretaria de Reforma Agraria – SRA) regulates national lands, identifies unused lands, expropriates land for public purposes and is involved in the implementation of PROCEDE. The GOM created the Office of the Agrarian Attorneys General (Procuraduria Agraria) in the wake of the 1992 Agrarian Law. The Procuraduria, which is now housed within SEDATU, is responsible for providing legal assistance to ejidatarios and comuneros in discerning and exercising their rights under the 1992 reforms. (Brizzi 2001; Brown 2004; Barnes 2015; OECD 2015a). The National Agrarian Registry (Registro Agrario Nacional – RAN) is the federal agency responsible for recording rights to land under federal control, including ejidal, comunidad, and colonias land. All acts related to the use, disposition and modification of these land rights must be recorded with RAN, which operates through state-level offices. RAN is also responsible for issuing: (1) certificados particulares, which document a household’s rights to individually cultivated plots and its proportional share of common-use lands; (2) urban plot certificates; and (3) titles for land held in domino pleno, which are then registered in the Public Registry of Property. Other rights pertaining to private property are also registered by the Public Registry of Property, which is decentralized to local offices. RAN is now part of SEDATU (Brown 2004; Penner and Associates n.d.; Barnes, et al. 2015). CORETT, operating through state-level offices, is housed in and acts as the executive of the Sub-secretary of Urban Development and Planning. It is primarily responsible for regularizing informal settlements on ejido land. In 2016 it was renamed Instituto Nacional del Suelo Sustentable (National Institute of Sustainable Soil-INSS) (GOM 2010; Barnes, et al. 2015; GOM 2016). The National Institute for Statistics and Geographic Information (INEGI) is charged with mapping and delineating ejido boundaries (both for individual plots within ejidos and boundaries between ejidos) (Haenn 2004; Barnes, et al. 2015). Before 1992, ejidatarios could not legally lease, sell, mortgage or otherwise transfer their rights to ejidal land, although informal transactions were common. The 1992 reform permitted leasing and sharecropping of ejidal parcels. Land can also be freely sold within the ejido, but not to outsiders unless the ejido’s governing body has decided to permit privatization (domino pleno) (Deininger and Bresciani 2009; Barnes, et al. 2015). The development of a vibrant rural land market has not generally ensued from the 1992 legal and institutional reforms. The most recent estimates are that only 6-9% of all ejidos have opted for privatization representing only 2.5% of total ejidal land area. Those that have privatized were generally located in peri-urban areas and did so to take advantage of high market prices and infrastructure development. In general, rural ejidos did not have this motivation, however as land sales prices in most rural areas have been low in part because corporations prefer renting over buying, with an eye to relocation flexibility. Poor soil quality and location diminish the value of many rural plots. Also, only about 5% of cropland is irrigated and farmers in ejidos are less likely to have irrigation than private farmers. Lack of access to water reduces the value of much rural land; in areas where ejidatarios do have access to water (for example, in areas within an existing irrigation district), plots are more valuable and so easier to rent. Further, for many ejidatarios the primary value of the land plot is not commercial; the plots are instead considered important assets for social security, through subsistence yields that augment unstable wage labor (Castellanos 2010; Deininger and Bresciani 2009; Barnes 2014; Barnes, et al. 2015; OECD 2015; World Bank 2017). One of the unintended outcomes of legalizing ejidal land sales has been a rise in informal transactions. As far back as 1997, unregistered transactions accounted for 60–70% of transactions in ejidal land. Recent studies have found an active land market exists within those ejidos which have not privatized. These transactions include extralegal and unregistered land sales to outsiders, leases and sharecropping arrangements (Torres-Mazuera 2014). The failure to formally register is attributed to a number of factors, including: (1) scarcity of ejidal land for sale, which leads to higher competition among potential buyers; (2) mistrust of ejido representatives who might otherwise advise community members to register land sales; and (3) the persistence of cultural norms that oppose the sale of land. In addition, changing rules around ejidal land sales have pushed some transactions into the informal sector. In some places of high land demand in Mexico, such as tourist and coastal areas, investors are increasingly acquiring ejidal land prior to official disincorporation, with only a verbal commitment that the title will pass at a later point (Bouquet 2009; Penner and Associates n.d.; Barnes 2014; Barnes, et al. 2015). The 1992 reforms and PROCEDE have led to some increase in lease transactions. According to a 2009 study, land rental markets operated more efficiently where ejidal land was certified than they did where ejidal land was not certified. According to another study (reported in 2005), approximately half of all leases of land in ejidos were to outside lessees, such as private individuals and companies (Castellanos 2010; Deininger and Bresciani 2009; Barnes 2014). Rental markets function differently in ejidos that have completed the land-rights certification process and ejidos that have not. In non-certified ejidos, large farmers tend to be transferees who lease in land, and small farmers tend to be transferors who lease out land, while the opposite is true in certified ejidos. Thus, in non-certified ejidos, the rental market tends to contribute to land concentration instead of redistribution towards smaller producers. By contrast, in certified ejidos, the exact opposite is true – the rental market is more active and distributes land towards those with lower endowments. This is consistent with the hypothesis that the implementation of PROCEDE increased tenure security and, by allowing small landowners to increase their operational holding-size through renting land, helped bring about efficiency-enhancing land transfers. Certification of land rights appears to have increased overall demand for cultivated land and allowed small producers to enter the market on the demand side (Brizzi 2001). When approved by a two-thirds majority vote, common lands of an ejido or a comunidad can be transferred to a mercantile or civil company of the ejido’s or comunidad’s creation in which the ejido, comunidad or their members participate (Barnes, et al. 2015). Urban land prices vary greatly. As in most cities, land prices are lower on the outskirts of the city. Unserviced land plots on the urban periphery may cost $1–2 per square meter (2003 data). In contrast, a premier city center property may be as high as $2,900 per square meter (2015 data) (Prud’homme 2003; World Bank 2009b; OECD 2015a; Global Property Guide 2015). The Constitution of Mexico (1917, with amendments through 2015) provides that private property may, with compensation, be expropriated for uses deemed to be in the public interest. The Law of Expropriation (1936) provides for expropriation of land for “public utility,” which is broadly defined to include the creation of rights-of-way, municipal facilities and public services as well as the creation or development of an enterprise that benefits the public, which could include private development projects. Compensation is generally determined with reference to the property’s value as assessed for taxation, subject to modification by accepted expert testimony (GOM Constitution 1917; Del Duca 2003; Ley de Expropriacion; US State Dept. 2017). The 2014 Petroleum Law effectively provides for compulsory acquisition, at least temporarily, of land targeted by energy companies for petroleum investment. While encouraging energy companies and those holding rights to land on which those companies wish to operate to reach a negotiated agreement, if such an agreement is not reached within 180 days the company can ask a federal judge to impose a settlement and require the land holder to relinquish the land, at least temporarily. The company may also ask the Ministry of Agriculture to initiate compulsory mediation. In either case, the land holder does not have the right to refuse. Thus, the result may be short of expropriation as in many cases the land holder receives payment for allowing the company to temporarily occupy the land for exploration, drilling and other activities. The law contains specific provisions intended to ensure fair compensation to land holders. In addition, the 2014 Electric Industry Law (which covers generation, transmission, distribution and marketing of electricity) requires that social impact assessments and public consultations with affected communities be carried before new energy projects can be approved. The Secretariat of Energy (SENER) is primarily responsible for overseeing social impact assessments and consultations (Payan 2014; Ley de Petróleos Mexicanos 2014; Congressional Research Service 2015; Godoy 2017; Mayer Brown 2014; Save, et al. 2014). Several laws and regulations explicitly govern the expropriation of ejidal land. These include: the 1992 Agrarian Law and the Regulations of the Agrarian Law on Matters of Organization of Rural Lands; the Expropriation Law; and the Regulations of the Institute for Administration of National Properties. Taken as a whole, these provisions require that, during the expropriation process, the government conduct an appraisal to determine the commercial value of the land and improvements. Payments for the value of the property are made either directly to the ejido or to the National Fund for the Promotion of Ejidos. The 1992 Agrarian Law clarified rules and safeguards on expropriation, including compensation requirements. One issue that remains unclear, however, is how to evaluate and compensate the rights of a third party in possession of the land, such as a lessee, in the event of expropriation. The energy reforms of 2014, including the Petroleum Law, the Electric Industry Law and other legislation enacted to implement the reforms, apply to ejidal and comunidad land (Deininger and Bresicani 2001; González and Lopez-Gastélum n.d.; Payan 2014; Ley de Petróleos Mexicanos 2014). Land disputes have been common in Mexico in both rural and urban areas. On ejidos, disputes related to inheritance and parcel boundaries are common. Prior to the 1992 reforms and PROCEDE, lack of parcel boundary demarcations was a significant cause of disputes. Although ejido members were supposed to receive equally-sized plots for individual cultivation, boundaries were not well marked or measured, and many members suspected that their plots were too small (Haenn 2004; Deininger and Bresciani 2001; Brizzi 2001). Within most ejidos, disputes among members were resolved by the General Assembly or by the comisariado (elected by the General Assembly). However, reliance on non-ejido bureaucrats to help resolve land disputes was not uncommon; in some cases, the local mayor (presidente municipal) would help resolve disputes between individual members and the ejido itself (Deininger and Bresciani 2001; Castellanos 2010). Following the adoption of the 1992 Agrarian Law, the federal government created a new court system to ensure accessible and effective justice for the ejidal and non-ejidal sector, and to reduce the authority of elected comisariados, many of whom had assumed a great deal of authority and control within the ejidos. This new system contained 42 Agrarian Tribunals (Tribunales Unitarios Agrarios) as well as an appeals court, the Tribunal Superior Agrario. The Agrarian Attorneys General (Procuraduría Agraria) was also established to serve as a sort of ombudsman for rural land rights, helping rural landholders negotiate the justice system to secure their rights. Between 1992 and 2013, the court system processed approximately 740,000 conflicts, settling 95% of them. In dealing with conflicts, the tribunals are explicitly instructed to seek a settlement out of court (Castellanos 2010; Barnes, et al. 2015). There are many disputes between indigenous groups and others who wish to use the land for commercial agriculture or grazing. Recent court decisions have tended to favor the indigenous groups, such as the Huichol people in Nayarit State. SEDATU has been asked to step in to help resolve the disputes, which it reports number more than 300 as of late 2016 (Barnett 2016). Land disputes in urban areas are also common. Almost 5% of Mexico’s ejidos are located in the country’s 110 main cities, and 15% of all ejidos are affected by problems caused by land invasions and informal settlements. This has given rise to widespread conflicts between new (informal) occupants and ejidatarios, undermining the broader framework of governance in rural areas (Brizzi 2001). As a part of the 1992 reforms, the GOM instituted a massive land-rights regularization program known as PROCEDE. The goals of this program were to register and title land rights in ejidos and comunidades to strengthen land tenure security, improve the efficiency of rural land markets (and credit markets), and pave the way for privatization. Although PROCEDE ended in 2006, its activities were taken on by RAN and CORETT, which was charged with addressing tenure issues in informal settlements within ejidos and comunidades. Overall, the program was highly successful in regularizing land rights across rural Mexico. By 2012, the land of 94% of rural ejidos had been certified (Barnes, et al. 2015; Deininger and Bresciani 2009; Barnes, et al. 2015). CORETT operated two programs through its state-level offices. The first, PASPRAH, is the Program to Support Regularization for Residents in Informal Settlements Who Lack Title and Live in Conditions of Material Poverty (Programa de Apoyo de los Avecindados en Condiciones de Pobreza Patrimonial para Regularizar Asentimientos Humanos Irregulares). This program provides up to 10,000 pesos to qualifying families to pay for the costs of registering and titling their land. The second program, Apoyo CORETT, targeted poor residents of informal settlements who wanted to regularize their land rights but did not meet the requirements to participate in PASPRAH. This program offered beneficiaries 7500 pesos toward the costs of regularization (Perramond 2008; GOM 2010; GOM 2015). In light of Mexico’s rapid urbanization, the government created SEDATU in 2013 to oversee housing and urban policy and bring about a more coordinated response to Mexico’s urban challenges. SEDATU was established to bring together and harmonize the actions of several ministries and agencies involved in housing, transport and urban-related services at all levels of government. The current administration also adopted a National Urban Development Programme and National Housing Programme which aim to: (1) improve coordination among responsible government institutions; (2) help move the nation toward a sustainable urban development model; and (3) provide all Mexicans with decent housing. These and other measures have helped the country to fill in its quantitative housing gap and provide permanent housing for more of the population. More broadly, though, capacity gaps still pose a significant challenge to Mexico’s cities, such as urban sprawl (OECD 2015a). The government developed the Sectoral Programme for Agricultural, Fisheries and Food Development 2013–2018 to ensure food security and increase agricultural productivity, competitiveness, sustainability and equity (FAO 2016). Mexico is a signatory to NAFTA. Exports of Mexican farm products tripled since NAFTA took effect, reflecting how the treaty benefited agribusinesses and large farmers growing cash crops for export. In the same period, NAFTA may have had the effect of forcing some 2 million small farmers to leave farming. Mexican support for small farmers was dismantled under the agreement, and small and subsistence farmers grew poorer. Many corn and bean producers lost their livelihoods when cheaper, subsidized imported products flooded the market. In contrast, agribusinesses and large farmers growing cash crops for export benefited (Weisbrot, et al. 2014; McBride and Sergie 2017). USAID supports cross-sectoral projects that focus on improving land use to reduce greenhouse gas emissions to decrease vulnerability to climate change and preserve biodiversity. One such project aims to develop sustainable landscapes to mitigate climate change, improve sustainable rural livelihoods and bolster natural resource management capacity at the local level. The project is a partnership with Consejo Civil Mexicano Para la Silvicultura Sostenible (CCMSS), which will work with communities in Quintana Roo, Campeche and the State of Mexico (USAID 2015). USAID has also formed a partnership with Keurig Green Mountain, Inc., Cooperative Coffees, Starbucks, and Root Capital to help coffee farmers in Mexico and other Latin American countries resist coffee rust. The partners have created a $23 million Coffee Farmer Resilience Fund for this purpose (USAID 2014). From 2009 to 2014, the World Bank provided over $39 million to the Global Environmental Facility for a project to promote efforts to address the impacts of climate change on coastal wetlands in the Gulf of Mexico (Global Environmental Facility 2016). FAO supports several programs in Mexico. One is a $1.7 million project on sustainable land management. Others include projects to boost national and regional food security and nutrition and assist with climate change adaptation and mitigation initiatives (FAO 2016; FAO 2017a). In 2011, the Inter-American Development Bank made a $190 million loan to Mexico to promote sustainable increases in agriculture and fisheries productivity (IDB 2011). The Dutch government funded the first three years of a program developed by Semillas, a non-governmental organization that aims to address traditional gender inequalities in Mexico. This program trains indigenous women leaders to campaign for a woman’s right to own and inherit land (Semillas 2013). Mexico’s average annual precipitation is estimated at 1,429 cubic kilometers, generating a surface runoff of 350 cubic kilometers. The average aquifer recharge is estimated at 91 cubic kilometers, and 17.6 % of total actual renewable freshwater resources are withdrawn annually. In 2011, total water extraction for consumption and non-consumption uses was 244.9 cubic kilometers, of which 136.1 cubic kilometers were used for hydropower and 80.3 cubic kilometers are used for consumption. Of the water used for consumption, 76.7% is for agriculture and livestock, 14.3% for public water supply and 9.1% for self-supplied industry. Ninety-seven percent of the urban population and 92% of the rural population have access to an improved water source (FAO 2013; UN-Water 2013; GOM 2014a; World Bank 2017). In the past 60 years, population growth has caused a fourfold reduction in the amount of available water per capita, putting Mexico under severe water stress. Scarcity is driven by increasing demand from growth in population, industry and agriculture, climate change, deforestation, soil erosion and pollution. Water resources are not evenly distributed throughout the country and scarcity is becoming critical in some river basins. The northern Mexican states are the most intensely water-stressed, as they face limited water availability, aquifer over-pumping, pollution, extreme events such as drought, and water conflicts. In contrast, the central states are moderately water-stressed, while the southern states are only minimally water-stressed. If current trends continue, Mexico is projected to experience a serious water shortfall by 2030 (FAO 2013; World Bank 2013; UN-Water 2013; GOM 2014a; Spring 2014; OECD 2015a; Godoy 2015). The government provides direct subsidies on water for both production and consumption, creating an artificially low price for the resource. This has caused low-efficiency use and overexploitation and thus harm to biodiversity and the agricultural ecosystem. Irrigation infrastructure has deteriorated, the use of irrigation technologies in rainfed land has not increased since the 1970’s and investments in more efficient irrigation technologies nationwide are low. In Mexico’s arid and semiarid zones, many irrigation districts and irrigation units supplied both by surface and groundwater face serious problems due to demographic pressure, urban growth, and prolonged drought. Moreover, direct water subsidies and indirect subsidies on energy primarily benefit large-scale farmers and not smallholders. Many farmers have been forced to abandon their lands due to high pumping costs and poor water quality, and many economic activities sustained by groundwater risk imminent collapse (GOM 2014a; FAO 2016). One of the most severe water problems in Mexico is the increasing contamination of both surface and ground water. Over 70% of all lakes and rivers are polluted to some extent. Water quality is harmed by agricultural runoff, lack of municipal sewage facilities and disposal of much of the industrial wastewater without adequate treatment. This is exacerbated by the failure to adequately monitor and enforce anti-pollution laws and penalties applicable to industry and municipalities. Studies show severe restrictions on use in many basins due to the prevalence of poor water quality, especially in the central and northern regions. An important issue affecting relations between Mexico and the US is the high level of pollution along the Río Bravo/Río Grande border and in the Río Tijuana and Río Nuevo in Baja California. As of 2013, Nuevo Laredo alone dumped over 18 million liters of raw sewage into the Río Grande daily. Both countries use the river for irrigation and for energy generated by hydroelectric plants, two of which are operated by Mexico (IBWC n.d.; Satija 2013; Spring 2014; Schmidt and Brand 2016; FAO 2016; UN-Water 2013). Mexico is one of the countries that is most vulnerable to climate change. Variations in temperature and precipitation are set to increase between 2013 and 2030. This will cause variations in the availability of both groundwater and surface water and will also affect rivers, lakes, reservoirs, coastal lagoons and wetlands (World Bank 2013a; GOM 2014). The Constitution of Mexico (1917), Article 27, states that waters that lie within the limits of the national territory are property of the state, and that the state has the right to transmit dominion over the water to individuals in accordance with rules and conditions established by law. (GOM Constitution 1917; Guerra 2013). The National Water Law (LAN) was approved in 1992, and its regulations were passed in 1994. It was amended in 2004 and again in 2016. The law sets out broad mandates for the development and implementation of plans and policies related to water-resources management and assigns the National Water Commission, created in 1989, the responsibility to carry them out (Lopez 2016; Guerra 2013; UN-Water 2013). The Constitution was amended in 2012 to make water a basic human right but necessary amendments to the LAN have yet to be enacted (GOM 2014a; Spring 2014; Godoy 2015). Mexico and the United States jointly administer the International Boundary and Water Commission (IBWC), an entity formed to facilitate joint management of the three transboundary rivers (Colorado, Tijuana and Río Bravo/Río Grande) pursuant to bilateral treaties covering the sharing of river water (Guerra 2013). Under LAN and its regulations, irregular and provisional water permits must be recorded in the Public Water Rights Registry (REPDA), and all users of national waters must obtain a concession entitlement and record it in the REPDA. The concessions are granted for terms of 5-30 years, state the authorized amount of water and how it will be used. Concessions can be extended if requested at least six months before the end of the current concession. For domestic purposes (such as watering gardens and providing domestic animals with drinking water), surface water may be freely used so long as its quantity is not significantly diminished and there is no harm to water quality or the stream bed (Guerra 2013; UN-Water 2013; FAO 2013; Lopez 2016). Although Mexico is one of the few countries in which the large majority of water users are registered, the registration of water rights is problematic. Water rights are registered to newly recognized or newly established Water User Associations for set periods of time. However, there is no clear continuity with existing water rights, no consideration of local water-rights arrangements, and no consideration of reduced water access caused by overexploitation. In addition, many concessions have expired but users continue to extract water because they are unaware of the need to obtain an extension or simply ignore the obligation to do so (Palerm-Viqueria n.d.; Asad and Garduno 2005; GOM 2014a). Because of a salt water intrusion problem, the Mexican government constructed an aqueduct connecting the Novillo Dam to the city of Hermosillo. The government proceeded despite failure to consult with the Yaqui indigenous group in the area or to obtain permission from the National Water Commission to transfer the water. After several weeks of protests by indigenous groups in 2013, the Supreme Court ruled that the state government had proceeded without taking into account the legitimate water rights of the indigenous people, the legal owners of the water rights. After additional judicial proceedings, the Supreme Court upheld the legality of the project although it ordered Secretaria de Medio Ambiente y Recursos Naturales (SEMARNAT) to redo its previously inadequate environmental impact statement (Spring 2014; Barry 2015). Three key institutions are involved in the water sector: (1) the National Water Commission (Comision Nacional del Agua – CONAGUA), at the federal level; (2) water commissions (Comisiones Estatales del Agua – CEAs), at the state level; and (3) 13 basin authorities and basin councils, which in some cases are not fully operational. CONAGUA is the highest institution for water-resource management in Mexico, and its jurisdiction includes: water policy; water rights; planning; irrigation and drainage development; water supply and sanitation; and emergency and disaster management. CONAGUA is formally under the authority of the Ministry of Environment and Natural Resources. CONAGUA has generally lacked the capacity to fully implement its mission of managing and preserving national water resources, and achieving a sustainable use of the resource, with stakeholder participation (OECD 2013; Guerra 2013; FAO 2013; UN-Water 2013; GOM 2014a). CONAGUA collaborates with government institutions at all levels—federal , state and municipal—as well as user associations and companies and institutions from the private and social sector, and international organizations. Municipalities are responsible for drainage, sewage treatment and wastewater services, as well as providing potable water (FAO 2013). Mexico initiated its 2030 Water Agenda in 2011. It sets forth the government’s long-term vision for sustainable use of water resources. The agenda seeks to balance supply with demand for water, ensure universal access to clean water and keep settlements safe from catastrophic floods (OECD 2013; UN-Water 2013). The National Water Plan 2014-2018 (LAN) calls for a comprehensive reform and modernization of the water sector in Mexico. It is explicitly aligned with the National Development Plan 2013-2018. The specific objectives of the LAN are to: (1) strengthen integrated and sustainable water management; (2) increase water security against droughts and floods; (3) improve water supply and access to drinking water, sewerage and sanitation services; (4) increase the sector’s technological, scientific and technical capacities; (5) ensure sustainable water availability for agriculture, irrigation, energy, industry, tourism and other economic and financial activities; and (6) consolidate Mexico’s international involvement in water issues. Accordingly, the government intends to: (1) reform the legal framework for water; (2) implement institutional reforms; (3) improve the capacity of human resources charged with water sector management; (4) reform and strengthen the financial system for the water sector; and (5) reform the water planning system (GOM 2014a). The World Bank provided $4.5 million through the Global Environment Facility towards the “Adaptation to Climate Change Impacts on the Coastal Wetlands in the Gulf of Mexico through Improved Water Resource Management Project.” The Mexican government provided $21 million in co-financing. The project sought to reduce vulnerability to the anticipated impacts from climate change, focusing primarily on the coastal wetlands of the Gulf of Mexico. Another objective was to evaluate the overall impacts of climate change on national water resource planning. The project ended in 2015 (Global Environmental Facility 2016). USAID supported a project to reduce greenhouse gas emissions in Mexico through improved watershed management. The project operated in the middle Usumacinta, the Pacific Coast, the Chimalapas and the Sierra Tarahumara to train watershed users in sustainable watershed use and management. USAID also worked with the GOM to improve the production technology of state and municipal water utilities and optimize urban water-use systems (USAID 2009). In recent years, USAID has supported the US Forest Service’s watershed management work in Mexico. This work has included improving local capacity on the sustainable management of watershed and aquatic resources in Sierra Gorda Biosphere Reserve and providing technical assistance in the protection of Rio Laja community watershed (USAID 2005). In 2014 the World Bank agreed to provided $55 million for the Oaxaca Water and Sanitation Sector Modernization Operation Project to support the improvement of the State of Oaxaca’s institutional framework for sanitation and water supply sector and to improve the water supply in selected urban areas (World Bank 2017b). In June 2010, the World Bank approved a $450 million loan to support GOM efforts to adapt the Mexican water sector to climate change. The proposed outcomes of the loan include: development of a management plan for primary aquifers; improved availability of information on Mexico’s water resources; increased productivity of irrigation systems; and an increase in the proportion of treated sewage from 36% to 60%. The project ended in 2014 (World Bank 2010). The Inter-American Development Bank (IDB) has funded several water-related projects in Mexico. These include $150 million for the Program for the Sustainability of Drinking Water and Sanitation in Rural Communities (PROSSAPYS II); funds for cleaning up the Bay of Campeche; a $200 million loan to improve water sanitation and supplies in urban areas; $450 million to improve the sustainability of rural water supplies; and $25 million to improve rural water supplies and sanitation services (IDB 2016; IDB 2016a; IDB 2016b; IDB 2016c). The Japan Bank for International Cooperation provided a $210 million loan to fund the Baja California Drinking Water and Sanitation Program (FAO 2013). Mexico has 66 million hectares of forest, representing about 34% of national territory. About 53% is primary forest (REDD-desk 2013; World Bank 2017). Mexico has a series of mountain ranges covered by temperate forests. Mexico’s geographic location results in highly diverse ecosystems, divided about evenly between temperate and tropical forests. The country has the largest number of indigenous pine species in the world. Mexico also has about 1,800 commercial forest plantations, covering about 117,000 hectares. Pine represents about 80% of harvested tree species (Goldstein, et al. n.d.; WRI 2016; Mexican Conifers 2017; Torres-Rojo, et al. 2016). Mexico is one of the five most biodiverse countries on earth. It has 173 protected areas, constituting 13% of total land area. The Mayan Forest, which covers parts of Mexico, Belize and Guatemala, is the largest remaining tropical forest in the Americas. The most endangered forest types are cloud forests and dry forests, both rich in biodiversity. In the communities surrounding these forests, poverty is widespread and the forest sector makes a smaller contribution to local employment and income than do the agriculture and cattle-raising sectors. 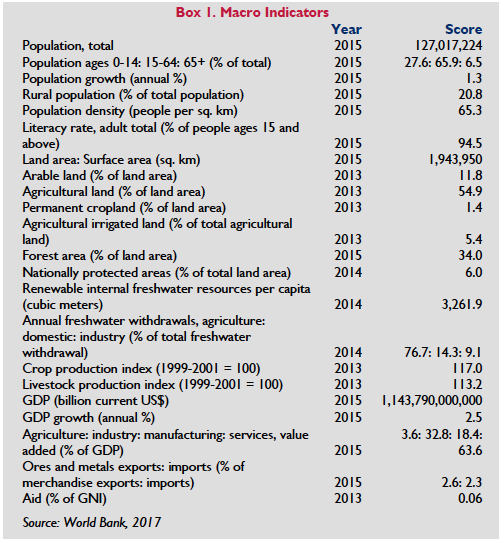 Generally speaking, deforestation, uncontrolled forest fires and illegal cutting occur mostly in contexts of poor social capital, lack of investment in the forestry sector and scarce opportunities for economically viable and legal forest use (WWF 2017; Nature Conservancy n.d.; REDD-desk 2013; Convention on Biodiversity n.d.; World Bank 2013; World Bank 2013a; World Bank 2017). Deforestation occurs at a rate of 0.24% per annum and, while that rate represents a significant improvement over previous years, remains a pressing environmental problem. Between 2010 and 2015, Mexico lost approximately 458,000 hectares of forests. Forest degradation and deforestation continue, primarily due to the conversion of forests to agricultural and pasture land. Other factors contributing to deforestation include illegal logging, mining, urban development, forest fires and other natural disasters. Although the rate of deforestation in tropical forests has also declined, it is higher than in temperate forests, thus threatening Mexico’s biodiversity (Conservation International n.d.; Convention on Biodiversity n.d.; USAID 2015a; REDD-desk 2013; World Bank 2017). In Mexico, forest-related activity is primarily regulated by the 2003 Law on Sustainable Forest Development (Ley General de Desarrollo Forestal Sustentable). The 2003 law states the requirements for obtaining authorization for forest use, as well as the commitments and obligations of the forest landowners and the GOM to conserve, protect, use sustainably, and restore forested areas of the country. Several additional laws complement the 2003 law in regulating forest use. The General Law on Ecological Equilibrium and Environmental Protection (Ley General del Equilibrio Ecológico y Protección del Ambiente) regulates activities for protecting biodiversity and reducing the impact on forests and tropical areas of certain forest activities. The Wildlife Law (Ley de Vida Silvestre) governs the use of plants and wildlife found in the forests. The General Law on Sustainable Rural Development (Ley General de Desarrollo Rural Sustentable) provides guidance for activities aimed at protecting and restoring forests within the framework of rural development programs. The General Law on Climate Change (Ley General de Cambio Climático) was enacted in 2012 to support climate change adaptation and mitigation strategies; it also requires Mexico to achieve a zero-deforestation rate by 2018. The Federal Law on Environmental Responsibility was adopted in 2013. Finally, the Agrarian Law (Ley Agraria) governs farmers’ ability to use forest resources on their land (Anta Fonseca 2004; Convention on Biodiversity n.d.; FAO 2016; REDD-Desk 2013). 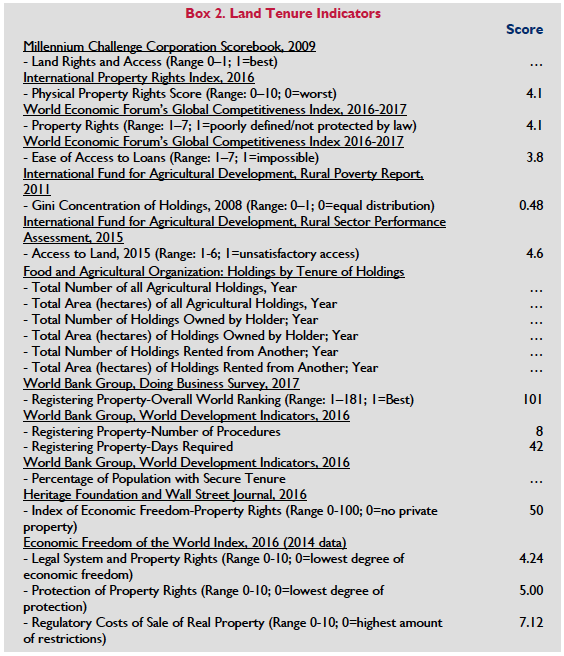 Of the total forest surface, about 70% is community property (belonging to ejidos and indigenous comunidades), 26% is private property (small-scale landowners), and the remaining 4% is government property (Spiric 2015). To use forest resources for commercial sale or convert forestland to other uses requires authorization from the Secretariat of the Environment and Natural Resources (SERMARNAT). Forest use permits are generally issued for 10 years. Forest exploitation projects of more than 20 hectares of tropical rainforest or forests in protected areas require an environmental impact. All transactions related to forest land ownership or management programs must be recorded in the National Forest Register (Registro Forestal Nacional) (Anta Fonseca 2004; REDD-desk 2013). Mexico’s forest regions are home to 12 million people who live in about 9,000 communities, many of which are indigenous. More than 50% of the inhabitants of forest communities live in conditions of extreme poverty, with inadequate access to health and education. These conditions undoubtedly affect the way forests are perceived and used, as well as the prospects for sustainability. Although sustainable community forestry practices are increasingly prevalent, most forest communities have yet to adopt sustainable practices. Economic improvements in these communities have been undermined by inadequate investment in community forestry planning, operations and monitoring. Subsistence agriculture has been and remains the main economic activity of forest communities; cattle-raising is also practiced and has gained importance due to the long-term presence of favorable subsidies (Goldstein, et al. n.d.; World Bank 2013a; Bray 2013; Spiric 2015; Torres-Rojo, et al. 2016; WRI 2016; Merino 2011). In Mexico, federal institutions govern regulation, advancement, protection and surveillance of forest resources. As such, the Secretary of Environment and Natural Resources (Secretaria de Medio Ambiente y Recursos Naturales – SEMARNAT) is in charge of regulating forest activities and authorizing the use of forest resources through its delegations in each of the 32 federal entities. The National Forest Agency (CONAFOR) is the agency in charge of promoting the activities related to proper forest use, forest protection, plantation development and restoration, as well as providing technical assistance to community forestry organizations (Guerra 2015; Puente, et al. 2016; REDD-desk 2017; GOM 2017). The community forestry sector in Mexico is among the most advanced in the world. Forest management plans are in place in about 3,000 communities. Of that number, around 35% are actively involved in some aspect of forest operations. An increasing number of forest communities have assumed full control over their forests through their community forest enterprises (CFE). Forests owned by communities are managed through institutional arrangements that vary from community to community. The main decision-making body in ejidos and comunidades is the General Assembly. SEMARNAT has a supervisory role, requiring communities to submit an environmental impact assessment and forest management plan before they can receive a permit for commercial operations. The Federal Ombudsman for Environmental Protection (PROFEPA) has the power to conduct audits to ensure communities are complying with their permits (Guerra 2015; Hodgdon and Murrieta 2015). Perhaps due to its high vulnerability to climate change, Mexico is an international leader in efforts to reduce and adapt to climate change. The issue is highlighted in both the 2007–2012 and 2013–2018 National Development Plans and detailed in the Special Programme on Climate Change 2014–2018. In 2009, Mexico adopted a long-term strategy in which the country committed to reduce its emission levels by 30% in 2020 and by 50% in 2050, compared to 2000 levels. It enacted the comprehensive General Law on Climate Change in 2012 that, among other things, adopts a multi-sectoral approach to the issue and makes broad commitments to substantially increase the percentage of energy from clean sources. The law also provides for incentives aimed at improving the living conditions of people living in forest communities and requires steps to reduce the deforestation rate to zero by 2018 (FAO 2016; Spiric 2015; USAID 2016). Mexico has been actively involved in implementing the Reduction of Emission from Deforestation and Forest Degradation (REDD+) Program. At the UNFCCC Conference of Parties in Cancun in 2010, Mexico presented its own REDD+ Vision and helped to lead the initial global agreement on REDD+. As of May 2016, the lengthy participatory promise of developing Mexico’s REDD+ strategy (ENAREDD+) was not yet complete. However, several pilot projects have been underway and promising REDD+ efforts are underway in selected areas. Mexico receives support from the World Bank’s Forest Carbon Partnership Fund and participates in the World Bank-supported Forest Investment Program (FIP) (Spiric 2015; Megevand 2016). Mexico is also seen as a global leader in forest management. Combining REDD+, enhancement of environmental services and community forestry, the country’s approach is a model in terms of increasingly innovativeness, scale, and results. Since 2001, CONAFOR’s demand-driven programs have served up to four thousand communities. However, despite receiving 38% of Mexico’s forest investments in 2011 ($486 million), reforestation efforts have achieved modest results. Of the area that was reforested nationwide, only half was in good or excellent condition one year later, and no systematic monitoring occurs beyond the first year. Meanwhile only 12% of forest investments went to managing natural forests. Thus, despite some clear successes, the effectiveness of Mexico’s climate change programs can be improved by, for example, designing interventions to more effectively reduce the incidence of deforestation and improving capacity within CONAFOR (World Bank 2013; World Bank 2013a). Since 2010 USAID has provided more than $50 million in support of climate change initiatives at the national and sub-national levels in Mexico. These initiatives include programs aimed at reducing greenhouse gas emissions from the forestry sector, among others. Specific programs include support for: (1) development of Mexico’s national REDD+ strategy; (2) the Consejo Civil Mexicano Para la Silvicultura Sostenible (CCMSS), a series of community-based initiatives with local and indigenous communities in the State of Mexico, Campeche, and Quintana Roo to foster sustainable rural economies, improve local capacities to manage natural resources and develop productive landscapes in order to mitigate climate change; (3) Alianza México REDD+, a coalition of international and national NGOs providing support to the Mexican government and others to implement strategies that encourage the protection of forests and ecosystems and address the drivers of deforestation in Mexico; and (4) technical assistance by the U.S. Forest Service to its GOM counterparts on design and implementation of REDD+ (USAID 2015; USAID 2016; Ghiso and Holmes 2016). In 2012, the World Bank approved the Mexico Forests and Climate Change project. The objective is to support rural communities in sustainably managing their forests and generating income from forests through mechanisms such as REDD+. The $725 million project is co-financed by the Bank, FIP and the GOM. In addition, the World Bank provided $300 million to fund the Strengthening Social Resilience to Climate Change Project (World Bank 2012; World Bank 2015a). FAO provides technical support to Mexico on REDD+ activities. The Inter-American Development Bank has: (1) provided $10 million to provide financing to comunidades and ejidos for low carbon activities in forest landscapes; (2) $2 million for the Ejido Verde Reforestation project; and (3) $150,000 for technical support under the Conservation, Reforestation and Community Development in the Biological Corridor project. The International Fund for Agricultural Development (IFAD) provided $5 million to the Community-based Forestry Development Project in Southern States (Campeche, Chiapas and Oaxaca) (FAO 2016a; IDB 2016d; IDB 2016e; IFAD 2016). Mexico is one of the leading mineral producers in Latin America and one of the top producers in the world of several mineral commodities. In 2013, the country was the leading producer of silver and among the top eleven producers of bismuth, fluorite, celestia, wollastonite, cadmium, molybdenum, lead, zinc, diatomite, salt, barite, graphite, gypsum, gold, manganese and copper (Perez 2016; Lopez 2016). The mining and metallurgy industry accounts for approximately 4% of the GDP of Mexico and employs an estimated 350,000 people. Although mineral deposits have been found in 22 of Mexico’s 33 states, most mining activity takes place in a handful of states including: Sonora; Chihuahua; Coahuila and Zacatecas. In 2013 gold, silver and copper accounted for almost 65% of the total mineral industry production by value. The total value of the industry in 2014 was $14.3 billion. Net exports of mineral products in 2013 were $10.35 billion, an 18% decline from the previous year. In 2015, Mexico’s exports of crude oil were valued at $18.8 billion, 62% less than in 2011. A significant portion of Mexico’s mineral output was produced by a few large domestic companies. Many industrial minerals, however, were produced by medium- and small-sized companies. In 2013, 266 foreign companies (about 70% of which were Canadian) operated in Mexico’s mining sector. Artisanal mining has a minimal effect on mining production in Mexico (Pro-Mexico n.d.; Lopez 2016; Perez 2016; Mexican Mining Review 2015; Workman 2017). With the adoption of energy sector reforms beginning in 2013, state-owned Petróleos Mexicanos (PEMEX) no longer completely controls the petroleum sector. Both foreign and domestic firms are now allowed to engage in exploration and production activities. Even though Mexico is one of the world’s top ten oil producers, domestic demand exceeds supply so that the country imports a significant amount of its gasoline. Crude oil production has been in decline for several years but officials and analysts believe the reforms will reverse this trend (CIA 2017; BP 2016; International Energy Agency 2016). The mining industry in Mexico has been plagued by conflict and alleged human rights abuses. In several instances, violent clashes between workers and security forces over unionization and salaries have resulted in injuries and fatalities. Anti-mining activists have reported being abducted and beaten by pro-mining groups. With support from NGOs, indigenous communities have gone to court to block mining projects, arguing that their rights under international treaties to which Mexico is a party have been violated (Fausset 2012; Godoy 2013; Inter-American Commission on Human Rights 2014; US State Dept. 2015; AFLCIO 2015; Lopez 2016). Exploration, exploitation and processing of all mineral or substance deposits are governed by the 1975 Mining Law, which was amended in 2005 to support deregulation of the mining sector and again in 2014. Regulations to implement the law were promulgated in 2012 and 2014. According to the law, mining activities may be carried out by Mexican private individuals, ejidos, comunidades, municipalities and corporations through concessions granted by the Federal Government. Foreign investors may own capital stock in Mexican companies. Foreign investors may also own 100% of the stock of mining corporations, but these must be incorporated as Mexican entities. Exploration activities may also be carried out by the Mexican Geological Service through mining assignments which are also granted by the Federal Government. The North American Free Trade Agreement (NAFTA) helped to precipitate an increase in foreign investment in the mining sector which in turn led to a substantial increase in mineral extraction (Sierra Club 2014; Lopez 2016; Perez 2016; GOM 2014; GOM 2016a). All actions concerning organization, modification and dissolution of corporations organized for exploration, extraction or processing of mineral substances must be recorded in the Public Registry of Mines. Similarly, all actions related to the mining industry, including transfers and termination of concessions, contracts for exploitation of minerals and other contracts, must be registered, too (Bosque 2016; Lopez 2016). The Federal Environmental Regulations apply to all mining concessionaires, and the government may require a satisfactory environmental impact assessment before approving mining activities (Lopez 2016). The legal framework for petroleum was changed substantially in 2013 and 2014 with adoption of a package of energy reforms. The reform ended the state’s monopoly on oil and gas production and established new structures in the energy industry. After approval of amendments to Articles 25, 27 and 28 of the Constitution, the following laws and supporting regulations comprise the most important components of the legal framework for petroleum: the Hydrocarbons Law; the Hydrocarbons Revenues Law; the Coordinated Energy Regulators Law; the Petróleos Mexicanos (PEMEX) Law; the National Agency of Industrial Safety and Environmental Protection of the Hydrocarbons Sector Law; the Mexican Oil Fund Law; and the National Hydrocarbons Commission Law. In addition, the Electric Industry Law restructures the regulatory framework for the overall energy sector and mandates social impact assessments and consultations with indigenous peoples for all energy projects (IEA 2016; Congressional Research Service 2015; Rocha and Holguin 2016; Save, et al. 2014; J.A. Treviño 2016). The 2013 amendments notwithstanding, under Article 27 of the Constitution of Mexico (1917) all minerals and substances existing in veins, strata, masses or beds, and which constitute deposits of nature different from land, are the property of the state (Congressional Research Service 2015; Rocha and Holguin 2016a). The energy reforms opened exploration, production, refining, transport, storage, petrochemicals and natural gas processing to private companies. PEMEX has become an independently managed state-owned enterprise (Congressional Research Service 2015; Rocha and Holguin 2016; IEA 2016). Mining concessions, which allow both exploration and exploitation, are for 50 years, renewable for another 50 years. Concessionaires have the right to expropriate land necessary for installation, storage plants and other facilities, easement of access, power and water lines, and use of subsoil waters. Under the Mining Law, mining activities are deemed to be in the public interest, thus giving concessionaires a preferential right over other land uses. However, concessionaires must comply with the requirements of the Agrarian Law by seeking an agreement with ejidos and comunidades if it requires access to areas belonging to them. If the parties cannot reach agreement, however, the state may still give the concessionaire access to the land if the concessionaire follows the correct process and pays compensation (Pro-Mexico n.d.; Lopez 2016; Almeida, et al. 2015). Mining concessions are subject to cancellation for a range of reasons, including non-exploitation, abandonment, lack of payment, failure to file required reports and lack of proper authorizations. Concession holders that fail to engage in exploitation during any two-year period within the first 11 years of the concession must pay a financial penalty (Deloitte 2016; Lopez 2016). Assignments and concessions are granted by the executive branch of the Federal Government through the General Bureau of Mining Regulation (Dirección General de Regulación Minera), housed at the Ministry of Economy. Oil and gas exploration and production activities are overseen primarily by the National Hydrocarbons Commission and the Energy Regulatory Commission. The General Bureau of Mining Regulation also operates the Mining Promotional Trust (Fideicomiso de Fomento Minero-Fifoni), which provides loans to mining companies at below-market rates. The Mexican Geological Survey generates and make available information on the geology of the country (Congressional Research Service 2015; Lopez 2016; IEA 2016; Ruiz, et al. 2014). The GOM’s National Mining Development Plan 2013-2018 sets forth the following strategic goals for the GOM’s involvement in the mining sector: promote higher levels of competition and investment; increase sector financing; support development of mining by small and medium enterprises and in ejidos and comunidades; and continue to increase efficiency and transparency in administration and the regulatory framework. The plan recognizes the need for Mexican mining to become more involved in the exploration and production of minerals prized for high technology manufacturing, such as such as titanium, cobalt, antimony and rare earths (Ruiz, et al. 2014). The legal framework for petroleum was changed substantially in 2013 and 2014 with adoption of a package of energy reforms. Among other things, the reform ended the state’s monopoly on oil and gas production, opening exploration, production, refining, transport, storage, petrochemicals and natural gas processing to private companies (Congressional Research Service 2015; Rocha and Holguin 2016a; IEA 2016). USAID does not appear to be active in mining reform. The Inter-American Development Bank has provided funding in support of the energy reforms. Other donors do not appear to be active in supporting reforms to the mining sector (IDB 2016f).